The general idea started with the book Getting Things Done. This gave me the core idea of having one place to track everything with specific steps for what do next so I don’t get hung up on knowing what I should do or where/how to start. The system it describes was too complex and heavy for me, but it gave me a rough guide. I don’t want to delve into the nuts and bolts of my procrastination, but I do want to mention the books The Now Habit and The Procrastination Equation as the only two helpful books of the many I’ve read on the topic. The former is a bit more touchy-feely and has useful strategies and thinking habits. The latter has hard science and insight into specific ways to get stuck and unstuck. Trello breaks notes down into cards, which can have notes, checklists, and file attachments. Cards are manually sorted into columns called lists, and a set of lists is a board. I only use one board so that I can see everything in front of me at a glance, and cards generally move across lists from left to right as things get done. The lists are “Big Picture”, “Later”, “This Week”, “Today”, “Done <year>-<month>”, and “Waiting On”. The first list is “Big Picture”. It holds template cards for my daily and monthly checklist templates. At the start of each day or month I copy them to new cards over in my “Today” list. The list also checklist templates for travel and “Clean all the things“. Trello includes colored labels you can add to cards. I use them to mark what project something is related to: happy green is personal stuff, like spending time with friends; boring yellow is life maintenance like taxes and chores; orange is NearbyGamers because that site is kind of orange, calm blue used to be the Well-Sorted Version and is now unassigned, active red is studying, and I don’t use purple. (Keeping myself to one or two projects instead of a dozen fun ideas that I drop whenever I get stuck is part of my success.) I keep a card for each of these in the Big Picture list to track long-term progress on the projects and remind me of what my overall goals are: to have a good life where the necessities are squared away and I’m making things. The daily card as a checklist has things that need to get done every day. Every day I copy it from “Big Picture” to a new card named for the day. It sounds simple enough, but it’s where most of my thought has gone into this system. Working through this checklist sets the rhythm for my day. By following it I don’t have to think and worry about a lot of little distractions; it is the skeleton that I flesh out with creative work. It starts with “Make the bed”, continues through a few daily chores, includes “Inbox Zero” and “Browser Zero”, and ends with “Floss and brush”. I have only rarely missed those first and last tasks, but they’re still important to have on the checklist. It’s caught me from forgetting the obvious, and I like starting and ending my day with the certainty that I’m doing what I need to. If you’re at all in doubt for the value of checklists, read the excellent book The Checklist Manifesto. Also, it helps to see that daily progress bar fill up a bit right from the start, it gives momentum for attacking the things I don’t enjoy. “Inbox Zero” means I need to clean out my email and other inboxes rather than use it for reminders and a to-do list. It’s good at getting me information, I need to get that squared away. “Browser Zero” means I want to see all the tabs closed on my browser rather than have a dozen things I plan to read later. The browser is not a reading queue. I get to check these boxes if I reach both of these at some point during the day, though I don’t tend to spend a lot of time there. My daily checklist is now 13 items, and I only change it deliberately and infrequently. In my first attempt I started with two dozen things that needed to be done or checked. I think I made it two days before I abandoned that attempt for months, disheartened. This time I started really small: it had “Make the bed” and “Floss and brush”, both things I knew I could do. After I made the habit of checking things off and felt the glow of a completed to-do list, I added a third thing. As a rule of thumb, I’ll only add something if I’ve completed the list for as many days as there are items on the list. If I want to add a 14th item (and I do), I won’t add it until I’ve gotten the current 13 things done for 13 days straight. It seems like a silly rule, to not add things I need to do to my to-do list, but it’s more important to reinforce that I really can do everything I set out to do and grow at a sustainable pace. The monthly checklist is a lot less interesting, it’s a list of chores. Check on backups, refill soap dispensers, get a haircut in even months, etc. I also make a new Trello list for archiving cards I’ve finished this month; I’ll explain that below. Each card is one decent-sized thing to do. More than a few minutes (or I’d just do it immediately) and less than a half day (or I get discouraged at how long it lingers). The “Later” list holds a month or so of cards, and daydreamy “wouldn’t it be cool if” ideas go off into a text file so I don’t stare at them and get discouraged at how infrequently they get done. Most cards start on “Later”, though time-sensitive ones will start in the “This Week” or “Today” lists if needed. Cards always have to be flowing towards the “Done” list. I had one card titled “Migrate NearbyGamers to current Rails” that lingered for months because I couldn’t predict smaller tasks. I had to fix one bug and see what new bug shook out and repeat that endlessly. I should have made a task for each bug as I went so I was building up a record of my progress. With one card that never moved, even as I coded and coded I felt like I was standing still. I fill the “This Week” list on Monday mornings. I haven’t yet gotten a feel for estimating the size of things so that I am consistently emptying it each week, though I’d like to. The cards tagged with the green personal label are the best ones. I use them to “unschedule” as suggested by The Now Habit. I start my planning with the things like friends, family, good books, and downtime that make life worth living to make sure that I have enough of that in every week. Then there’s essential life maintenance, starting with things that are due this week. As suggested by Now Habit, I stop to think about the consequences of not doing them. Some of them, like updating old passwords, can be safely ignored a while as long as I accept the security risk. An unpaid bill might bring a penalty fee, phone call, or black mark on my credit report — but is not the end of the world. Ignoring deadlines happens only rarely, but knowing these tasks are choices I can make rather than Official Stuff I Have To Do is liberating. The most important thing about the “Today” list is that it not have too many things. It needs to be empty at the end of the day, not have a bunch of sad cards that I have to drag back to “This Week” to replan. Sometimes this means breaking down cards I know I won’t finish in a day into several cards, but mostly it means assigning less than I know I can do in a day. There will always be surprises and distractions in every day. It’s discouraging to not finish and heartening to be happily working away and pull in an extra card because everything else is done. I’ve tried task-tracking systems with significant estimating and scheduling components — the book Time Management for System Administrators is an excellent one that I had a lot of success with at a previous job. I currently don’t get a lot of value out of that, so I dropped it. I try to arrange the tasks so I have large blocks of creative time with breaks for food and little chores. As I finish tasks I drag the cards to the “Done <year>-<month>” list rather than delete or archive them. I like seeing my accomplishments and I can glance at the colors to see if I haven’t been spending enough time on myself or a project. Every month I archive this list and create one for the new month. I like the regular opportunity to reflect on what I’ve done and what I’m going to do next. Last, I have a “Waiting On” list for things I’m waiting to hear back about. It was too frustrating to have cards lingering from day to day or week to week because I was waiting for paperwork in the mail. I glance at it daily and drag it back to “Today” to prod people as needed. If you let the FBI read your email without a warrant I’ve heard nice things about Boomerang, but I haven’t needed an automated system. When I sat down to write about how I drag little digital cards from left to right I didn’t think I’d spend 1,800 words on it, but I’ve put a lot of thought into a system for doing a lot of work. I wrote not because I think this system is perfect or for anyone else. I wrote because I was stuck and frustrated for a long time and I was helped by seeing what other people did (well, when that wasn’t a form of procrastination). I hope it gives you ideas on how to improve your own processes. 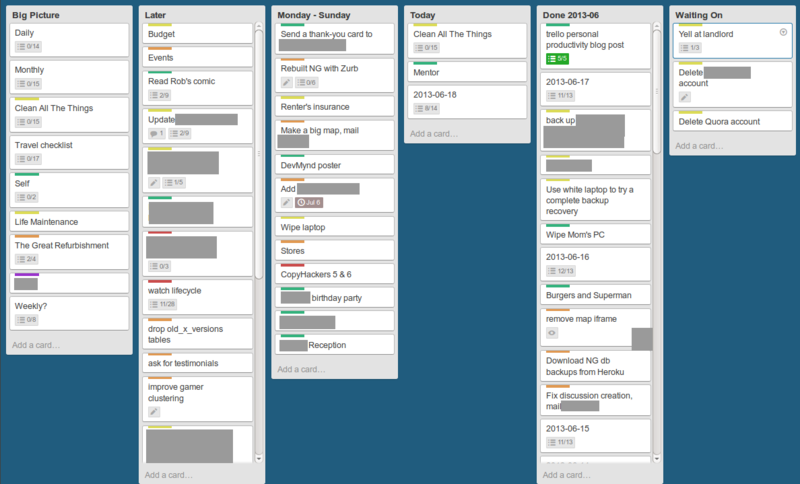 I use trello in a somewhat similar fashion. I was particularly reminded of this when you said you like to keep your “Done” lists. I use the “due date” feature for this, after I’m finished, where the due date was actually the date of completion. Great stuff. Been using trello about a month after a post on zenhabits and have been tweaking and optimize my use. Totally agree that the best thing I’ve read is not to put too much on the Today list. Also, I’ve learned that *specific* actions are needed for me, otherwise I will balk at it. I moved my Later list to the far right so I wouldn’t see it and get discouraged, but maybe putting the pie in the sky stuff elsewhere is a good suggestion. And just this morning I consolidated all the cards I have for weekly and daily cleaning items as two checklists on the one Household card in my Big Picture list. Do you have an “Inbox” list? The “Later” list is my Inbox, if anything is. So, not really. Thanks a ton for sharing: this is inspiring me in my constant quest to create a trello system that meets my needs.